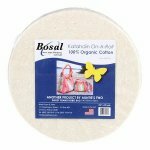 Double+ -96" x 93" Natural Mid loft, exceptional for hand quilting & excellent for machine quilting. 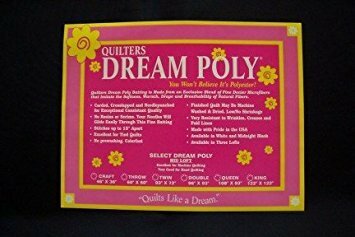 The perfect batting for antique quilts, wearables, warm climates & lightweight quilts Stitching may be up to 8 inches apart. King 122" x 122" White Thinnest loft, exceptional for hand quilting & excellent for machine quilting. The perfect batting for antique quilts, wearables, warm climates & lightweight quilts Stitching may be up to 8 inches apart. 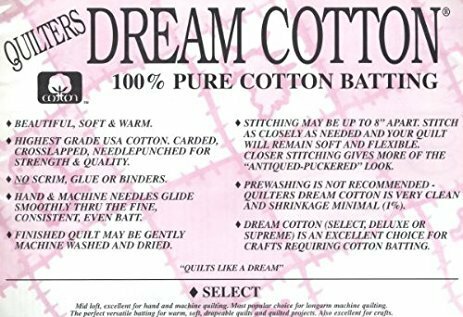 White- King- 122" x 120" Quilters Dream Cotton starts with the finest USA cotton and is carded, crosslapped and specially needlepunched. 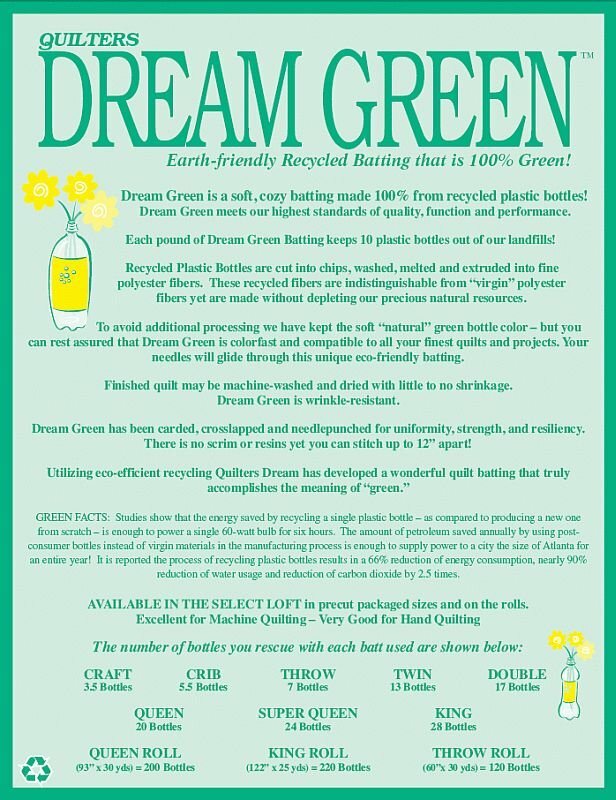 100% natural and environmentally friendly, our batting proudly bears Cotton Incorporated’s seal. 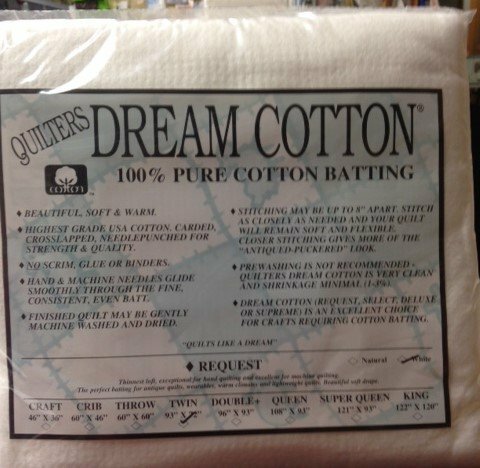 White-Queen- 108" x 93" Quilters Dream Cotton starts with the finest USA cotton and is carded, crosslapped and specially needlepunched. 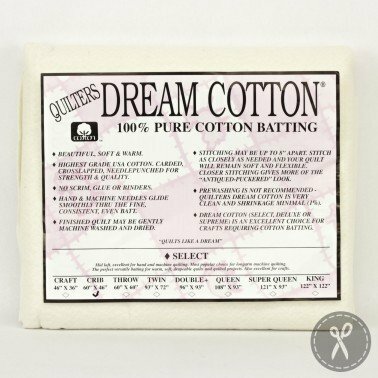 100% natural and environmentally friendly, our batting proudly bears Cotton Incorporated’s seal. 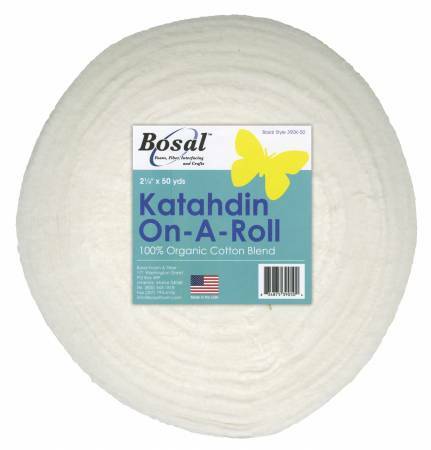 Runner Batting-18"x 30 yds Natural- sold per yd Thinnest loft, exceptional for hand quilting & excellent for machine quilting. The perfect batting for antique quilts, wearables, warm climates & lightweight quilts Stitching may be up to 8 inches apart. Super Queen 121" x 93" Thinnest loft, exceptional for hand quilting & excellent for machine quilting. The perfect batting for antique quilts, wearables, warm climates & lightweight quilts Stitching may be up to 8 inches apart. 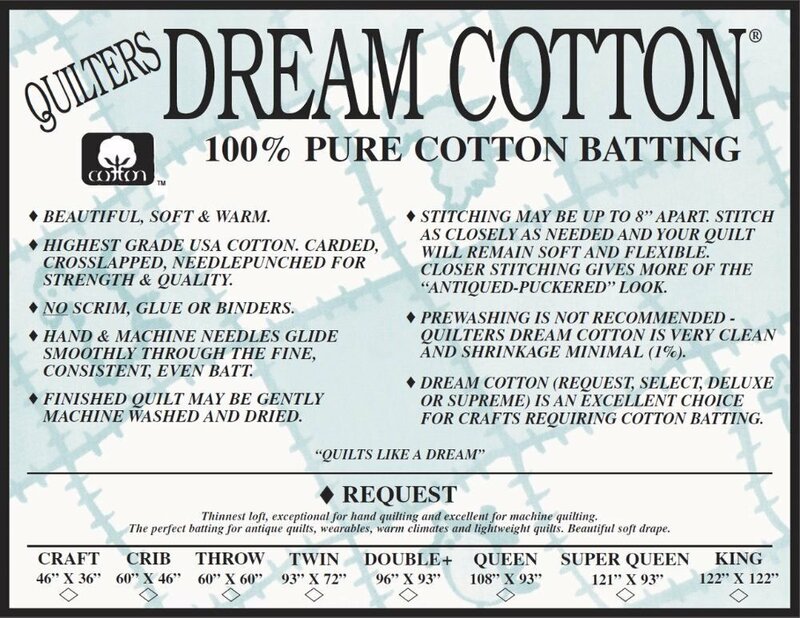 White- Super Queen- 121" x 93" Quilters Dream Cotton starts with the finest USA cotton and is carded, crosslapped and specially needlepunched. 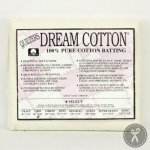 100% natural and environmentally friendly, our batting proudly bears Cotton Incorporated’s seal. 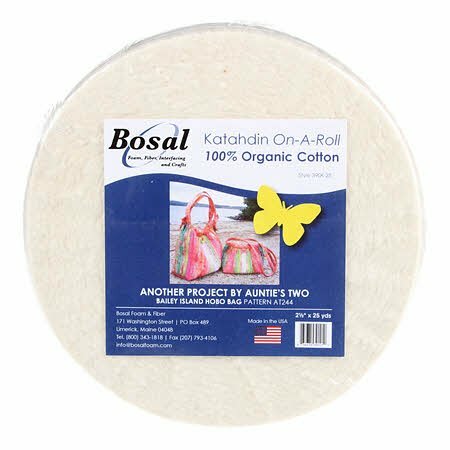 Natural twin 93X72" Quilters Dream Cotton starts with the finest USA cotton and is carded, crosslapped and specially needlepunched. 100% natural and environmentally friendly, our batting proudly bears Cotton Incorporated’s seal. 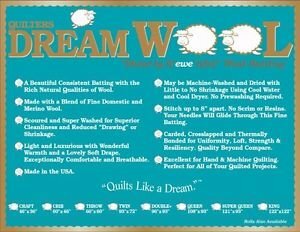 White twin 93X72" Quilters Dream Cotton starts with the finest USA cotton and is carded, crosslapped and specially needlepunched. 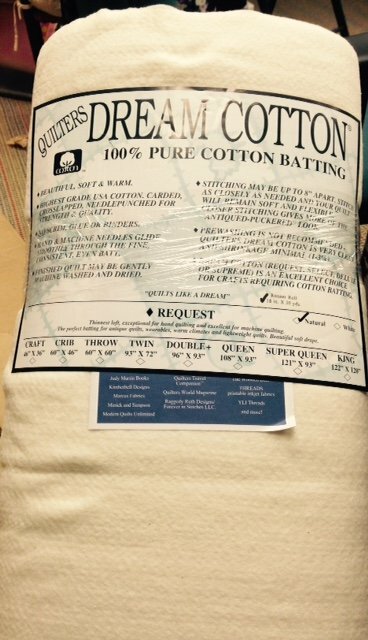 100% natural and environmentally friendly, our batting proudly bears Cotton Incorporated’s seal.